Kings Wolves, Princesses and Lions is an excellent primer for young readers... Classic tales retold with new energy... New tales that seem timeless, and a few old favorites that preserve the flavor of years gone by. 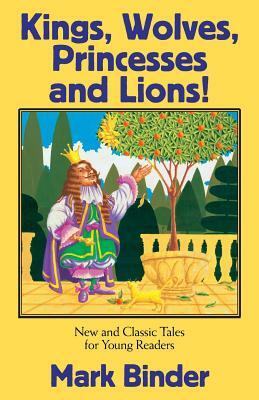 If you liked "The Bed Time Story Book" you'll love, "Kings, Wolves, Princesses and Lions." These are stories children will enjoy reading by themselves, or with parents and caregivers. And the grown-ups will enjoy reading them, too. Includes dozens of evocative and humorous old-school and wood-block style illustrations. Award-winning children's author, Mark Binder presents this collection of stories with the ear of a professional storyteller and the love of a parent reading to his family. ..".a gift for humor -- both broad and subtle..." - Publisher's Weekly ..".author and storyteller Mark Binder is the spellbinder..." - School Library Journal Part of the best-selling "Bed Time Story Book" series, this collection starts with simple stories for early readers, and then allows youngsters to stretch their skills. Target ages: Kings, Wolves, Princesses and Lions: Grades 1-3 The Bed Time Story Book: Grades PK-2 Genies, Giants and a Walrus: Grades 3-5 Bonus tips for reading-aloud at bed time An around-the world tour of Africa, Europe, the Americas and Asia. The five sections are broken down into Tales of Animals, Ordinary and Extraordinary People, Kings and Fools, American Favorites and International Classics. If you don't know these stories, you'll soon learn why so many of them are classics... Author and storyteller Mark Binder reworks, revises and invents stories that feel fresh while maintaining a strong connection to the past. With updated and extended versions of Aesop Fables, Anansi, The Three Billy Goats Gruff, Sleeping Beauty, The Brave Little Tailor, The Steadfast Tin Soldier, Rapunzel, Stone Soup (at Valley Forge), King Midas, Androcles, and a cast of mice, bats, weasels, cranes, dogs, wolves, and of course lions. Dozens of stories, including: The Three Billy Goats Gruff, Androcles and the Lion, The Princess and the Mouse, The Brave Little Tailor, King Midas and The Golden Touch, The Headless Horseman of Sleepy Hollow, Stone Soup at Valley Forge, Sleeping Beauty, The Steadfast Tin Soldier, Rapunzel and many more.